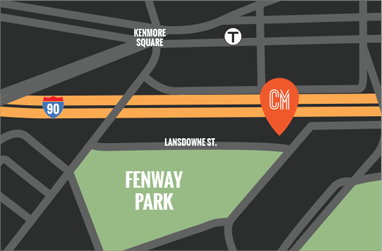 Mark your calendars Boston. 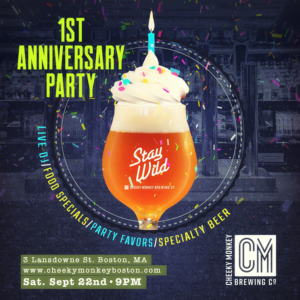 It is Cheeky Monkey’s 1st Anniversary! We want to thank you for an awesome first year with a party. Join us on Saturday, September 22nd at 9pm for a live DJ, games and more! Of course, we will be celebrating with some specials. Enjoy our specialty burger: ‘Monkey Business’. Two towering burger patties with sharp cheddar cheese, peppered bacon, fried egg, crispy onion straws and sriracha mayo on a buttered toasted bun skewered with crispy fried pickle chips. What’s a birthday without a cake? Our ‘Super Shake’ has a new twist for our celebration. On top of everything the Super Shake has to offer, it will be garnished with a ‘Confetti Cake’ Cupcake, complete with sprinkles, a candle, and special Happy Birthday message. There is no better way to spend your birthday with good drinks, food and especially good company. That’s how we love to spend ours!